On our about me Site you will find more information about us. 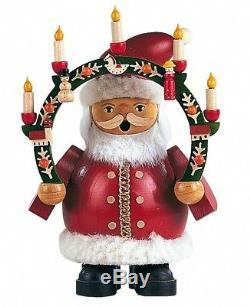 The item "German incense smoker Santa Claus under candlearch, height 16 cm. MU 16031 NEW" is in sale since Wednesday, November 28, 2018. This item is in the category "Collectibles\Holiday & Seasonal\Christmas\ Current (1991-Now)\Figures\Other Curr. The seller is "kuckucksuhr-net" and is located in Schönwald. This item can be shipped to North, South, or Latin America, all countries in continental Asia.